The Xiaomi Mi 4 flagship phone is more than a year-old, which makes the Xiaomi Mi 5 overdue. There is some speculation that the manufacturer is waiting for the Snapdragon 820 SoC to be available for the Mi 5. However, a recent teaser for the long-awaited phone suggests that Xiaomi is tired of waiting, and will use the Snapdragon 810 on its next flagship model anyway. Regardless of when the Xiaomi Mi 5 does finally see the light of day, the Xiaomi Mi 4c has already been certified by TENAA. Today, the phone has shown up with a listing in Oppomart, Oppo's online store. This is the first model built by Xiaomi that is powered by the Snapdragon 808 SoC and its hexa-core CPU (which in this case features a 1.8GHz clock speed). The Adreno 418 GPU handles graphics. The Xiaomi Mi 4c comes with a 5-inch, 1080 x 1920 resolution screen. That works out a pixel density of 438ppi. 2GB of RAM is inside along 16GB of native storage. A 13MP camera is on back, with a 5MP front-facing camera ready to snap selfies and handle video chats. Keeping the lights on is the job of the 3000mAh battery, and Android 5.1 is pre-installed with MIUI 7 on top. 7.8mm thin, the Xiaomi Mi 4c weighs 126 grams and is unlocked. The device offers support for 4G LTE connectivity and is priced at $229. While Oppomart does have the listing up, the phone has yet to be officially unveiled by the manufacturer. According to earlier reports, that won't take place until September 24th with the actual launch coming on October 3rd. For now, we can assume that the pricing is a place holder and that the specs are based on the TENAA certification. 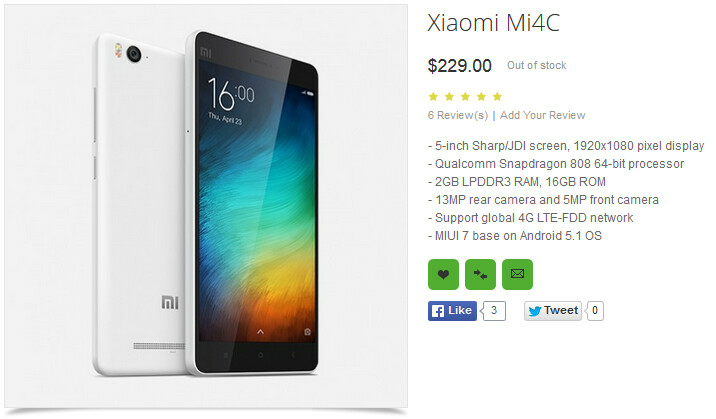 If you are planning on buying the Xiaomi Mi 4c, you still have a bit less than a month to wait. Can you hold on that long? Thanks for the tip, Raja! Oppomart and other Chinese webshops are known to create pages for future smartphones with rumoured specs and pricing, so just take a grain of salt at these listings. The rumoured pricing so far is between 192 US Dollar and 256 US Dollar in China depending on the model you are going to buy (2GB 16GB ROM or 3GB 32GB ROM). Add 40-50 US Dollar and you have the international reseller price. This phone looks like a nice competitor of Nexus 5X, most likely cheaper also. Do not trust Oppomart. I buy two time from oppomart first time they sent me a new phone, second time a used phone, I sent back and they stole me 400 euro on refound. “I’m sorry the packet arrived empty are you sure you put the phone inside?” Come on! Its almost identical to mi 4i except for the processor, the Snapdragon 615 being replaced by Snapdragon 808. Considering that the Mi 4i costs ~195$, this device can be expected to retail for 220$ or so. It's a midragne device, don't expect flagship specs. Mi4 is one year old and it's still more expensive. Nice looking, at least the company will start selling on the African continent soon. I think the helio X10 is slightly better. Single core performance of sd808 is better than helio x10, multicore performance of sd808 is worse than helio x10 (due to 6 vs 8 cores). GPU of sd 808 is also better than helio x10. The GPU may be better than expected. SD808 is better is every single important factor. I think Mi4C is also a higher model therefore it's better. It's also significantly smaller. Be very careful, Oppomart stole me almost 400eur on refound (sent me a used mobile of another old model and i sent back), they just wait PayPal time expire, don’t let time expire even they implore. Do not trust Oppomart. I buy from aliexpress and pandawill, it never happen something like this. Nice. Now jut make 32GB version because 16GB of non-expandable storage is not enough.